Shop our full selection of Standing Desk Exercise Equipment to find a great replacement. Walk while standing and feel the difference. 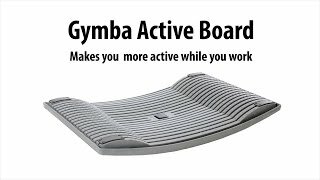 The Gymba Activeboard allows you to mimic walking postures while you sit and stand, increasing circulation and activating your leg, back, and core muscles for healthier working your way. Position the flexible platform facing up and mimic the motion of walking. Stand still to strengthen your core, back and leg muscles and improve posture. Placed face down, the platform features a carpeted surface that's ideal for calf and foot stretches. It's comfortable working for the win.